UBCycles is a hub for all biking activities at UBC’s Okanagan campus. We offer short-term and long-term rentals, workshops for a variety of skill levels, and tools for bike repairs. Commuters may store their bicycles in the UBCycles room and have access to day-use lockers, showers, and tools. 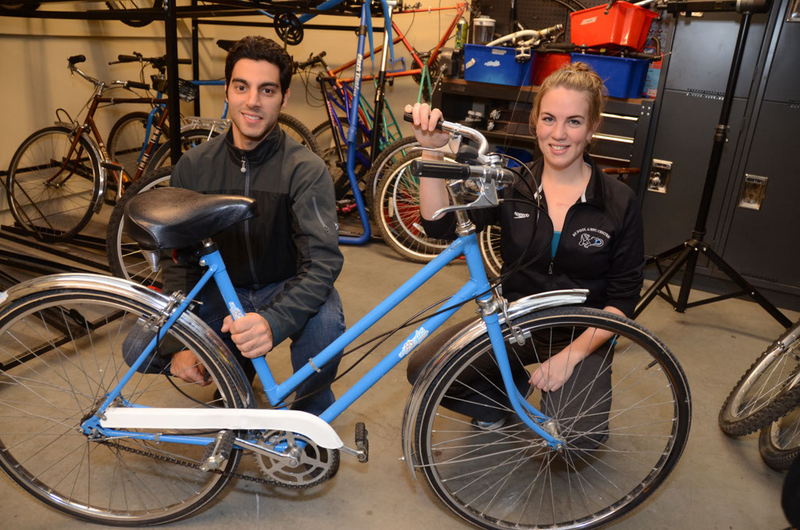 UBCycles uses reclaimed and refurbished bicycles purchased or donated from the Kelowna & the UBC community. We are always looking for more bikes to add to our fleet! UBCycles provides students, staff, and faculty the opportunity to use bicycles for exploring the campus and the community, in lieu of using transportation such as cars and motorcycles. UBCycles is located in UNC 233 on the second floor of the University Centre, just past the Student Services counter and around the corner from International Programs & Services. Hours are posted on our door, on our Facebook page, and can also be provided upon e-mail request. If you would like to rent a bike but our times conflict with your schedule, please feel free to contact us and we can arrange to meet at another time. Getting involved with UBCycles is both easy and rewarding. If you would like to be involved, please contact the UBCycles Coordinator. Volunteers will be asked to commit 3 hours per week to the program to maintain their status as volunteers.